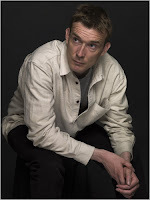 Last night, I went to an event at Toronto's annual International Festival of Authors - David Mitchell and William Gibson in conversation with someone else who I hadn't heard of, and who persisted in mispronouncing the name of the titular hero of Mitchell's latest novel, even after being corrected. Let's pretend that he wasn't there. But I'm getting ahead of myself. 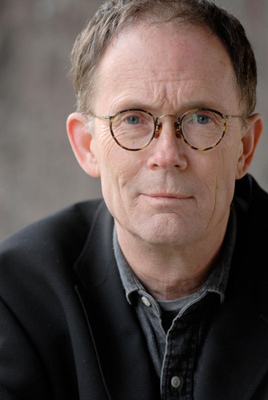 First, William Gibson read from his new novel, Zero History. I have yet to read any of Gibson's work, but what I heard was very engaging, so I'll make a point of checking him out. He does have a very unique voice, as Jason mentioned a long time ago now. It kind of made everything sound like a slightly stoned and somewhat funny hard-boiled detective novel; very enjoyable to listen to. As Jason is a big fan of Gibson's, I picked him up a copy of the new novel and got it signed. In between "Jason" and "William Gibson" I got the author to write that now famous blurb about the internet being a series of tubes...which increased the value of the book in my mind, but maybe not in either Gibson's or Jason's. Sigh. Right before I met Gibson (so much for my attempt at strict linearity here! ), I witnessed a fan-Gibson interaction that filled me with some hope about the yout' of today. Hope, mind, not unshakable confidence. Here's what happened: A girl-fan of approximately 16 years got Gibson to sign all her copies of all of his books. There was a limit on each person - only four books each - so she had a friend in tow to get the others signed on her behalf. She got all her books signed. She got her friend to take a photo of her and Gibson. And then she fled, shrieking in a very teenage girl sort of way. Hope: she was a teenaged reader absolutely stricken, not by Stephanie Meyer and not by whoever wrote those damned Gossip Girl books, but by William Gibson, who was writing what I'm told is the bestest of Sci-Fi long before she was even a high-pitched gleam in either of her parents' eyes. Incomplete confidence: She did still shriek like a harpy wielding a mystical sword to cut your face off with. Back to linearity. Right after Gibson read from his book, David Mitchell came out to read - not, as expected, from The Thousand Autumns of Jacob de Zoet, but from the new book he's currently writing! And it was really good, although he very humourously called himself out on some sentences he wasn't satisfied with. Afterward, they sat down with unknown fellow mentioned above and proceeded to show just what a bloody damned smart and cagey choice it was to put them together. They're both brilliant and funny and compelling, but even more so together, I think. A lot of the best parts - like when Gibson said people were "now-centric" and Mitchell said, "Oh, that's good!" and as he was writing it down asked in a very precocious way, "Can I have that?" - have been likely already been tweeted (hashtag #IFOA). But what likely won't make it to the Twitter - because it simply defies being put into words by everyone but me, for whom it happened - is how once the conversation ended, Mitchell and Gibson engaged in a complicated and highly ritualistic dance-fight, in which they attempted to win ascendancy in my heart. David Mitchell entered the competition with a huge handicap in his favour, for Cloud Atlas remains my favourite novel of all time (even if Hilary Mantel ought to be making him very nervous). Gibson, however, had the advantage of being a hippie draft dodger AND wearing cool sneakers AND owning a Twitter account called GAYDOLPHIN2. First they circled one another, executing flawless pirouettes, Gibson in his kicks and Mitchell in his signature steel-toes. Neither appeared to gain an advantage at this point, so they quickly changed tactics and re-enacted the dance-knife fight scene from Michael Jackson's "Beat It" but both quickly learned that if the pen isn't as mighty as the switchblade, it does cause some fearful stains on favourite shirts, and so altered their respective strategies again. While David Mitchell performed a modern, interpretive routine to Iron & Wine's "Flightless Bird, American Mouth" (a song which, for reasons I can't entirely explain, always makes me think of Black Swan Green), Gibson countered by performing the Robot to Run DMC's "It's Like That". At this point, it seemed as though Gibson would triumph for the Robot is the Michael Jordan slam dunk of dance-fight moves - it wins the game 99% of the time. That's all true - except for what I just said. Sounds really wonderful ... I do love author events when the authors engage with the audience. Mitchell sounds like a really interesting man. Thanks for playing along, friends!